The manufacturing sector takes raw materials and converts them into finished products. The manufacturing sector is concerned with using raw materials from the primary sectors, such as iron and coke and the production of finished goods, such as cars. 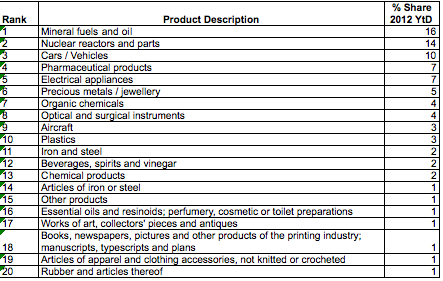 These manufactured goods can then be sold in the tertiary sector. 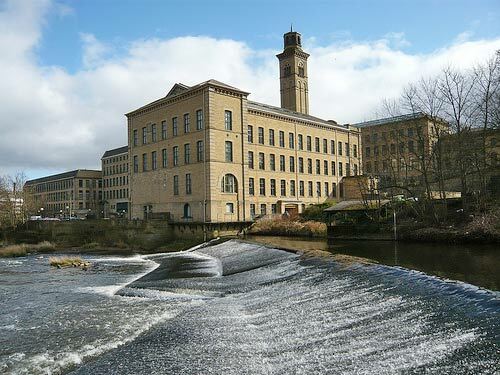 Wool mill in Saltaire, Yorkshire. Built in the Nineteenth Century to produce clothes from sheep wool. The manufacturing sector is to take these two raw materials and produce steel, which is then used to manufacture other goods, such as cars and bicycles. Small workshops producing pots, artisan production. Factories producing steel, chemicals, plastic, car. Food production such as brewing plants, and food processing. A primitive economy will rely on the primary sector; economic development allows more refinement of raw materials to produce goods and services with greater value added. To manufacture goods requires greater human capital, and also better technology to be able to make use of raw materials and produce a finished good. The UK economy was primarily based on agriculture until the eighteenth century. However, the development of new technologies like the steam engine enabled a rapid industrialisation and the growth of the secondary sector. The economic development encouraged people to leave the land and go and work in the new factories springing up across the UK. 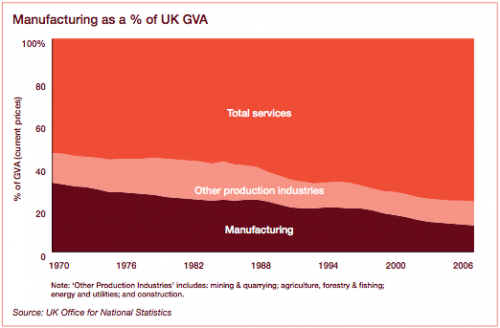 The manufacturing sector became the biggest employer and also the biggest component of the UK economy. The top goods produced in the UK include – nuclear reactors and the car industry. Note product ranked one – mineral fuels and oil is concerned with the primary sector, because it is the extraction of oil rather than the manufacture of a finished product. The UK was one of the first countries to undergo industrialisation. It was also one of the first to undergo – deindustrialisation. This is a process where the manufacturing sector becomes a smaller percentage of the overall economy. With greater value added, manufacturing enables higher real wages than in agriculture. Enables countries to specialise and benefit from economies of scale. What does the UK produce?